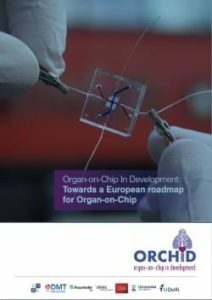 The ORCHID team was proud to present the first interim roadmap report entitled: ‘Organ-on-Chip in Development: Towards a European roadmap for Organ-on-Chip’ during the International Organ-on-Chip Symposium on November 8-9 2018 in Eindhoven, the Netherlands. This report surveys the current landscape in the research, development, applications and market opportunities for Organ-on-Chip devices to establish the pillars of a European OoC ecosystem. Based on a bibliometric study, a market analysis, expert interviews, and panel discussions held at the ORCHID Vision Workshop (Stuttgart, 23 May 2018), this report outlines presently unmet needs, key challenges, barriers and perspectives of the field, and finally proposes recommendations towards the definition of a European roadmap that could render OoC systems (OoCs) realistic models of human (patho)physiology in the near future. For a the report click here.